So, earlier this week, I sat down and just started pulling out beads and chain, and created this little beauty. It's what I do best I think. 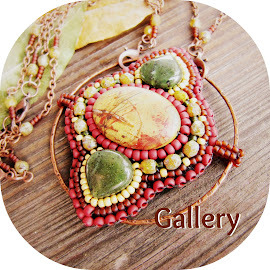 Simple embroidery with earthy colors and my favorite metal...copper. I've really gotten into wearing my necklaces long lately, and unlike some of my recent attempts, this one looks great worn really low. I've listed it in my shop here if you'd like to see more pictures. Still sticking on the long kick, I created this one as well. The two marquis shaped beads are black onyx, and I've embroidered around it with this funky green color and some bugle beads. The chain? I made it. 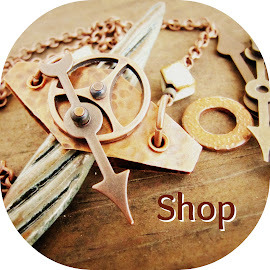 It's in my shop also, right here. In other news, I'm leaving tomorrow to visit my dad. He lives and works overseas. Waaay overseas. Two of my sisters are going with me and we're meeting him in Madrid for a few days before I head on over to where he lives. So, having said that, I'll be away from home for the next two weeks, but I will have computer access, so I'll still be able to e-mail tutorials (maybe with a little longer of a delay), but any jewelry bought from my shop will ship when I gets back on the 21st. Margie and Me is still on though and I hope you'll play along this month! I really like the palettes for this month and I think it's gonna be a challenge. Oh I hope you have a great and safe trip! Your necklaces are stunning as always! Amazing pieces! I love the bugle chain - very smart idea. Oh, and welcome to Europe - lucky you who gets to go to the warmer parts :) Hope you have a great trip! That first necklace is absoloutely gorgeous! I love the colors! Have a fun & safe trip! More amazing pieces! 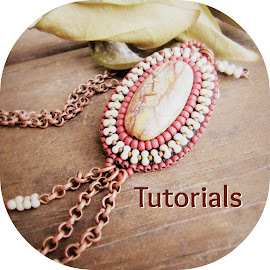 I love the Jungle Palm Bead embroidered necklace. Its gorgeous! Do enjoy your trip!!! And take lots of pictures...I'm sure you will see a lot of gorgeous places! Sure to inspire! Hope the trip is a BLAST! I saw that top necklace on Facebook and fell in love with it. BEE-utiful. I really enjoy seeing your latest pieces, they're all so unique and beautiful, and look forward to seeing lots more. I hope you have a lovely trip. Just found your blog through a link in an Artbeads e-mail. Just ordered stuff after a long time away. Very beautiful beadwork. I have added your blog to my blog roll. Beautiful! I'm slowly working my way through the bead soup blogs and having a blast looking at the newer posts as well as your bead soup project (had to laugh at Olympic Soup - great name and fun project).